Hi hi! Thanks for being here and following along as I blab about healthy stuff. I promise I'm doing my best not to be annoying but rather helpful. Maybe helpfully annoying? I'll take it! Wanted to share some insight into what has helped me and my clients stick to a healthy diet. How to easily make the best decisions when it comes to food no matter what your schedule is like. We know eating perfect 24/7 isn't an option (f*ck perfect) so lets go for a motivated mindset where prepared is key shall we? But then...you get an invite to happy hour. All your work friends are going and yolo so you scrap the annoying grocery shopping trip, head to the bar, drink a couple glasses of wine, share some appetizers and now you're heading home to eat a healthy dinner BUT your fridge currently consists of expired yogurt, bread, wilted spinach and a 1/2 full kombucha. Wooomp womp. Or maybe life got crazy, you missed your favorite class at the gym, and through the chaos of taking care of everyone else you finished whatever was left on your toddler's plate, was still hungry so inhaled some chips and hummus and went to bed thinking you failed again. I've been in BOTH of those situations (more than once if you were wondering). Corporate life, mom life, life life can really take a toll on your goals IF you let it. Here's my solution: Be proactive and PLAN ahead! Preparation is key. I'm not saying spend your entire Sunday meal prepping, I think I've made it clear how much the idea of that makes me cringe. BUT what you can do is hit up the grocery store at least 1 day a week for your proteins, fresh & frozen veggies + fruit, grains. *Cook once, eat twice. While making dinner, cook extra for lunch or even dinner the next day and prepare it a different way. For example, if you make salmon, asparagus and quinoa for dinner, take some leftovers and serve it over spinach with avocado for a filling salad the next day. When you prep it differently, it will seem like a new meal, not boring leftovers that you are reluctantly eating. *Roast it. Buy fresh veggies for roasting - cut, sprinkle with olive oil + s&p, then roast on a large baking sheet. You'll be able to quickly add to salads, heat for dinner or throw in a scramble for breakfast. Favorite veggies include eggplant, broccoli, squash, carrots, potatoes. Use whatever you like best! This is a quick, hearty way to add nutrients to any meal. *Grab and GO. Having things on hand like fresh fruit, baby carrots, nuts and hard-boiled eggs are all key when you need to run out the door or get a little hangry and need a snack. Also, all great things to add to your meals. 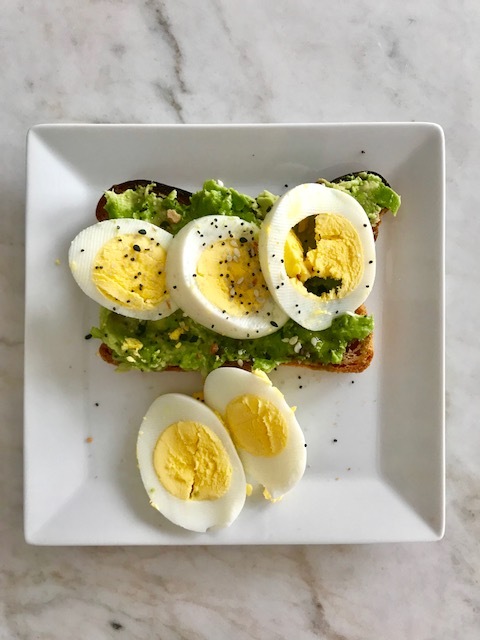 A sliced hard-boiled egg on top of avocado toast is my morning go to these days. *Add flavor. Nobody likes bland food. Blah. It's important to stock your fridge/pantry with sauces and spices to ensure dinner will be delish and satisfying. My favs include: vegan buffalo sauce, teriyaki, sriracha, organic spicy taco seasoning, cajun spices, cinnamon etc. Remember YOU are 100% in control of what and when you eat. Food is your fuel and it can be easy, healthy, delish.